Harry Potter and the Deathly Hallows Part 1, is the first part to a two part finale to the successful Harry Potter franchise. Once again Voldemort is terrorizing the wizarding world, but this time he finally gains what he is seeking – absolute control. Voldemort quickly gains control of the Ministry of Magic, and makes life hard for our protagonist Harry and his friends Ron and Hermione. The trio is forced to go on the run in order to seek Voldemort’s destruction through destroying a series of “Horcruxes” or vessels for Voldemort’s broken and twisted soul. This is unlike any of the previous Potter films, as we do not take one step inside Hogwarts School of Witchcraft and Wizardry. In fact the majority of the film is spent in isolation from the world of wizards and witches, which helps lend a somber tone to the whole affair. Gone are the days of potions classes and Quidditch matches, and instead replacing them are dangerous treks into the no longer friendly halls of the Ministry of Magic. Our trio must finally put into use the skills they have been learning over the past six films. Every film of the Potter series has seemingly gotten darker, and there is no change in this installment. This is very much the Empire Strikes Back of the Harry Potter series, where every move is a desperate attempt to thwart the growing regime of evil. Many people will regard this film as “slow”, given much of the action from the source material takes place in the last third of the book, which is what the Part 2 covers. Part of the reason for its slightly slower pace is the setup of exposition missed in earlier installments to prepare the viewer for the fast approaching finale. Many of the ideas within the film feel like they were pulled straight out of thin air, but have actually occupied the background of the story for quite some time. This might lead to some confusion among people who have not read the books. Luckily the visuals are enough to keep anyone focused on the film. Once again the cinematography is top notch, relying on dull tones, and a lot of grey scale to really heighten the somber mood of the film. I for one found myself in awe at moments where I took in the fantastic scenery and props made for the film. 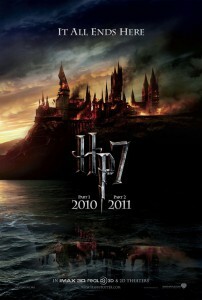 The Harry Potter films have effortlessly created a world which feels foreign, yet at the same time very natural. Visually there are few better films than Deathly Hallows, and this installment even has a short animated story in one part to show you this production team can do just about anything. The acting never suffers in this film, and it’s very captivating to watch the three kids who originated the roles step into harder material and really shine. It is quite an accomplishment to hire kids at the age of 11, and gamble that they will still have solid acting ability as an adult by the time they are 20. Although, what can you expect when you surround young actors with people like Gary Oldman, Alan Rickman, Michael Gambon, and Robbie Coltrane? The hardest part about reviewing this film is that it doesn’t completely stand on its own. As to be expected there is a massive to be continued when the story finally starts ramping up. The quality of Part 1 is all going to hang in the balance of the quality of the finish of Part 2. In the end, the first part of the finale is sure to illicit a lot of emotions from many unexpected twists and turns, but might disappoint those people who expected more answers in the first part of the finale. Currently my grade for the film stands at a B+, but could change for the better after seeing Part 2 of Deathly Hallows next July.